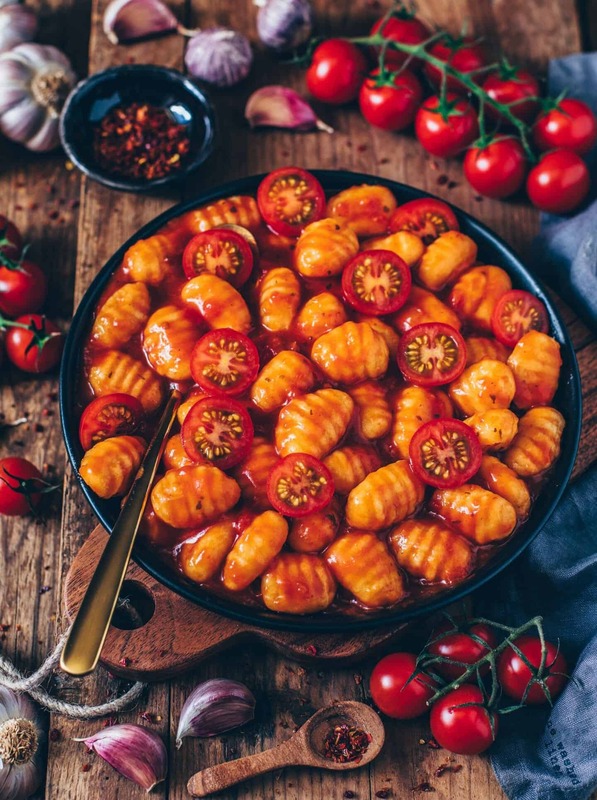 I don’t know about you, but after a long busy day all I’ve been wanting to do is relaxing and enjoy warm and satisfying foods, like this comforting gnocchi with tomato sauce! One thing I do love eating always is pasta or gnocchi. This kind of food to me is such comfort food, especially when it’s served with a delicious flavorful sauce. My absolute favorites are creamy mushroom sauce, mac and cheese sauce, avocado sauce and arrabbiata sauce but I also love a simple easy tomato sauce such as I did with this recipe. Not to mention this recipe only takes 10 minutes to make and almost all the ingredients can be bought in advance and easily stored. 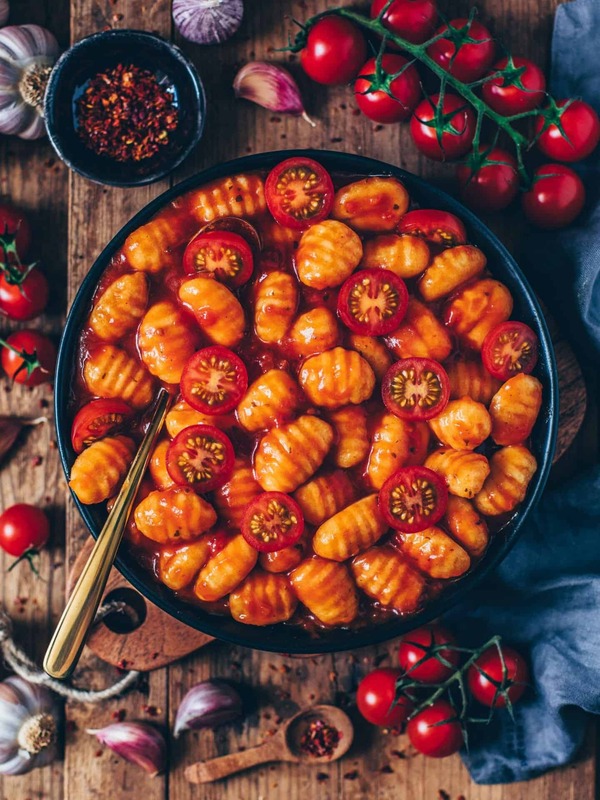 I always make sure to have some prepared homemade vegan gnocchi in the freezer but you can, of course, also use store-bought gnocchi to make this recipe. 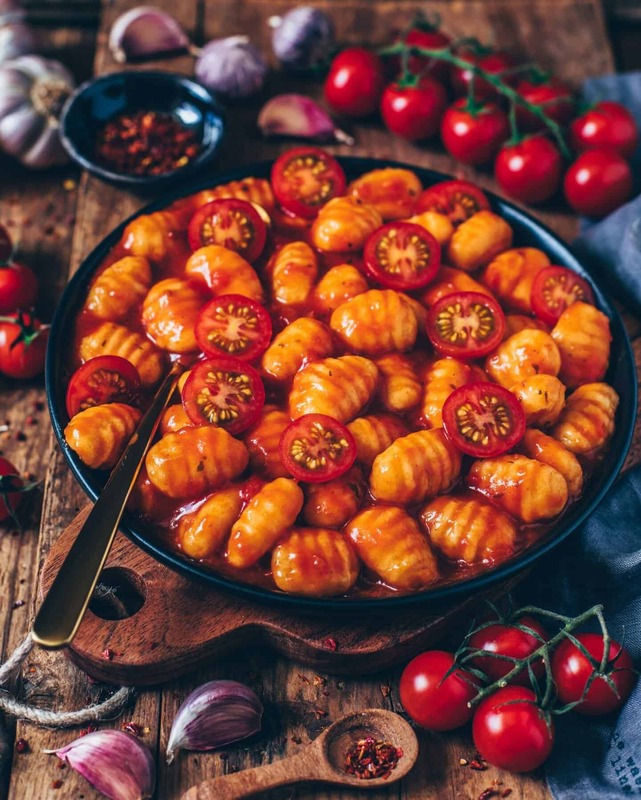 If you can’t find any egg-free vegan gnocchi in the supermarket or organic store, head over to my recipe for homemade vegan gnocchi. To form them easier you can use a gnocchi plank but it also works well by using just a fork. Don’t be sad if they won’t look so perfectly when you make them the first time but they will still taste delicious! Another thing I love about making gnocchi yourself is that you can make them in advance and store in the fridge, so they are ready when lunch or dinner comes around. Or you can also freeze them in batches to have some in stock for further meals. I kept the sauce super simple, so there are less ingredients required to make the sauce. The most important ingredient is, of course, tomato passata. Creamy dreamy sauces are my favorites but you can also use chopped tomatoes, if you prefer a chunky sauce. Since we’re just getting into tomato season, I love to top it off with some fresh homegrown cherry tomatoes. I think seasonal tomatoes taste best! But honestly, I also buy tomatoes in winter because I’m so crazy about tomatoes. Feel free to add any other vegetables you like. If you’re looking for some inspiration, head over my gnocchi-vegetable stir-fry recipe. If you’d like to make extra servings, simply double this recipe and prepare for the next day to take to work. 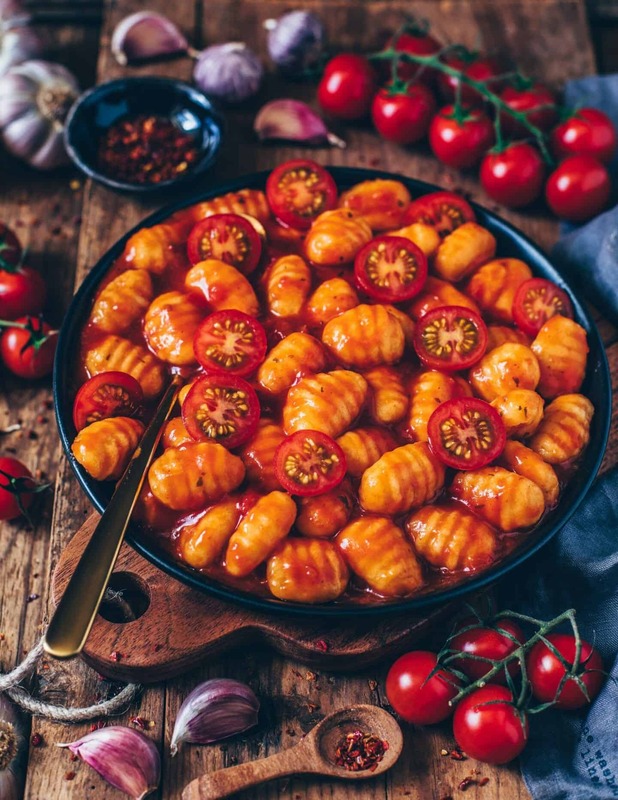 These gnocchi with tomato sauce are incredibly delicious and a perfect meal if you want a quick and easy lunch or dinner. This recipe is vegan, gluten-free and ready in just 10 minutes. Heat the olive oil in a saucepan. Sauté the onions until they begin to soften (2-3 minutes). Then add garlic and cook for a further 1/2 minute. Add pureed tomato. Season with salt, pepper, sugar (and Italian herbs) to taste. Cook at low heat for approx. 5 minutes, stirring occasionally. In the meantime, cook gnocchi according to packaging instructions or until they float to the top of the boiling water (3-4 minutes). Then drain, add to the sauce and stir to combine. Season again to taste. Serve with cherry tomatoes and vegan parmesan cheese/ nutritional yeast flakes or plant-based cream, if you like. 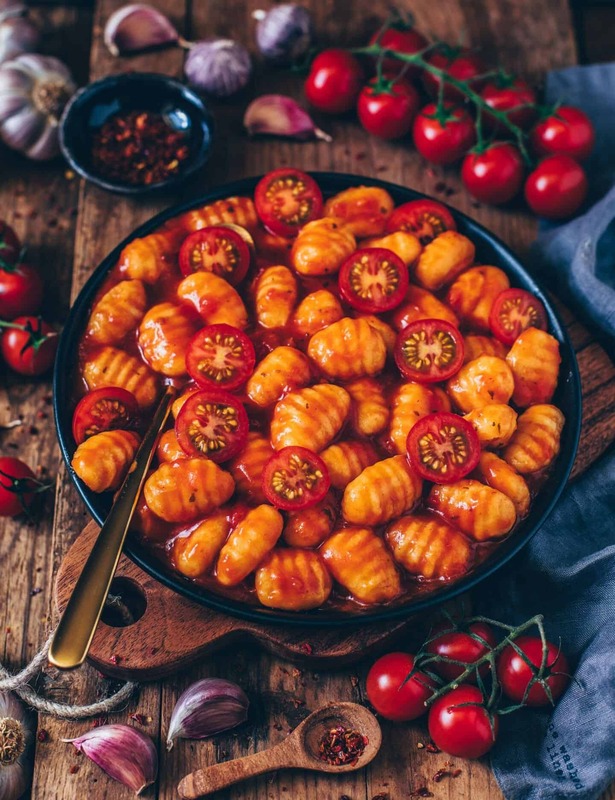 You can use fresh store-bought vegan gnocchi or make them from scratch with this recipe -> "homemade gnocchi (vegan)"
If you prefer a chunky sauce, you can also use chopped or crushed tomatoes. So glad that you like my pictures as well. This is hands down my new favourite site. Your photography is stunning and food recipes so simple yet incredible! 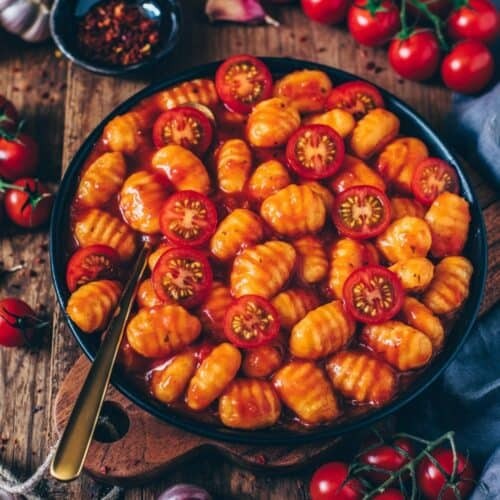 Great recipe, delicious gnocchi. I really enjoy your Instagram and blog!! !